1980s Vintage Trangias, A Decade of Change. 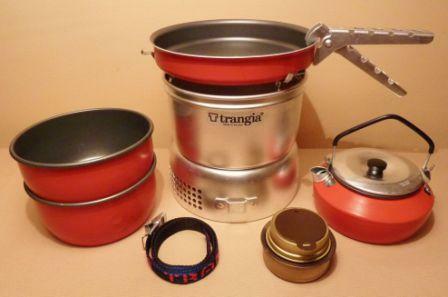 Lets start by taking at look at an early 1980s vintage Trangia, the photo below shows a model 25 stove, set up with all its various components. The upper windshield has the Trangia badge, which is also included on some late 1970s models. 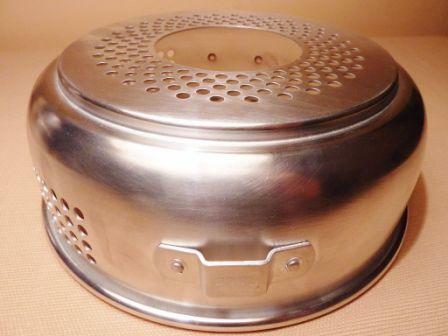 As with all vintage Trangias, the aluminium used in manufacture is a heavier gauge than later versions, this early 1980s vintage Trangia stove is no exception. 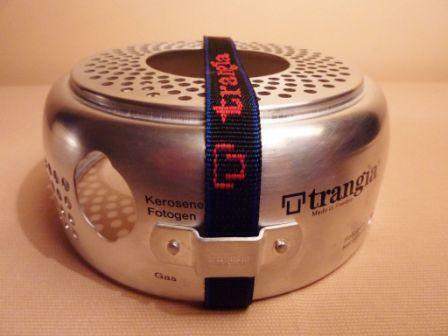 First, you'll notice the different style strap, the Trangia logo is in blue capitals, with a red border and white background. 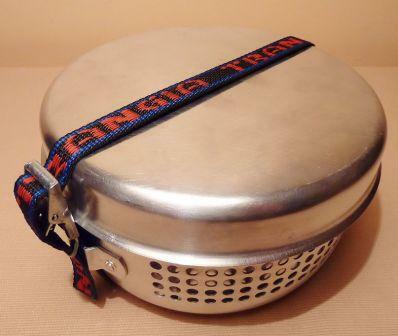 This style of strap is a sure sign that this is an early 1980s vintage Trangia. Taking a look at the lower windshield, you'll notice the riveted strap retainers are embossed with the 1980s style Trangia logo. 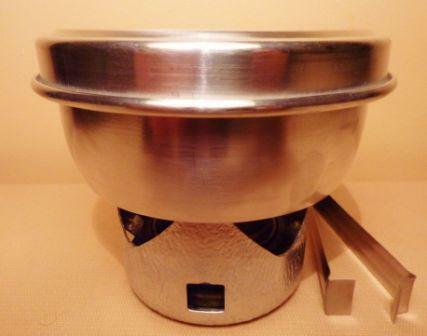 This early 1980s Trangia burner is the first generation burner to have an "adjustable" simmer ring, notice how the dark brown adjustable piece at the top of the simmer ring doesn't have the small handle at the edge for easer opening and closing. Furthermore, this design wasn't around for long, it was soon upgraded to include the handle, as this was more user friendly, hence the first generation simmer rings are quite rare. 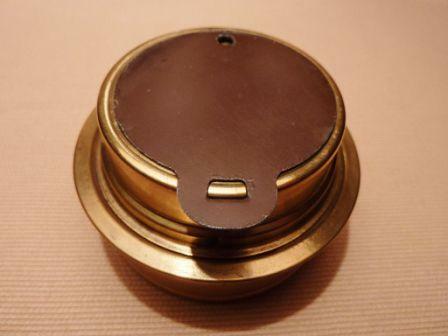 For comparison, the second photo shows a later style burner and simmer ring with the small handle on the edge. Other than the handle, both simmer rings are identical and completely interchangeable with each other. 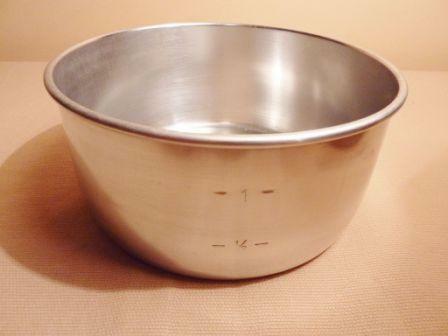 More clues to dating a Trangia can be found on the side of the small saucepan, notice the litre graduations, and how different styles were used during different periods. 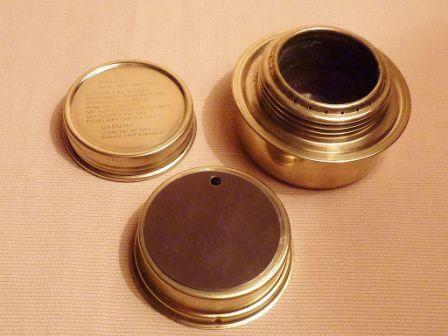 The photo on the left shows the small saucepan from the model 25 pictured at the top of the page. 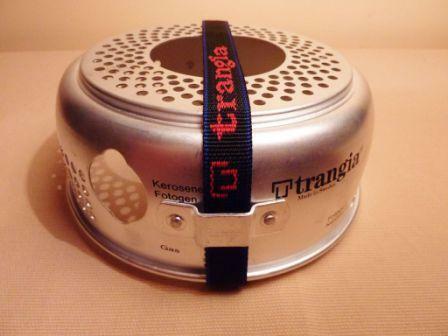 Trangia boxes can provide useful information to help establish the age of your stove. 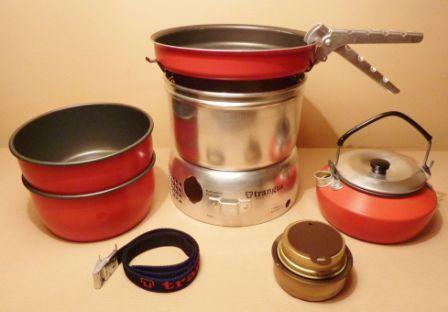 The photo on the left is the original box for the model 25 stove pictured above, although its for an early 1980s vintage Trangia stove, the same box was used for late 1970s Trangias, so should not be used as definitive reference, but as a general indication only. You can see from the photo that the strap now has a black background, blue borders, and Trangia written in red capital letters. An easy mistake to make is to confuse this stap design with the later and current versions due to having the same colour scheme. 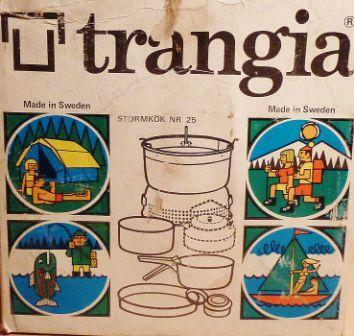 Later versions were not written in all capitals, additionally they now include a "T" logo before the word "trangia". 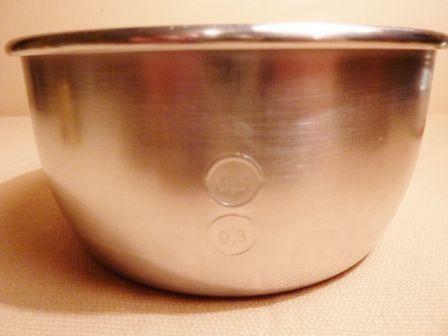 Here again we have different markings on the small saucepan, notice this time the circular style of the litre graduations, as apposed to the earlier 1980s models linier style graduations. Circular style markings have been used since the mid 80s to the present day. 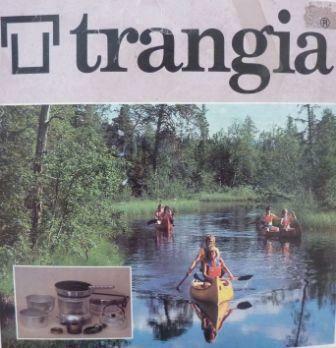 During the mid 80s the graphics on the box changed, also notice in the bottom left corner of the box, there's a small picture of a Trangia stove, notice how the non-stick frying pans outer surface is plain aluminium, not red, like the later 1988 non-stick pans, a good indication that this box is for a mid 1980s vintage Trangia stove. 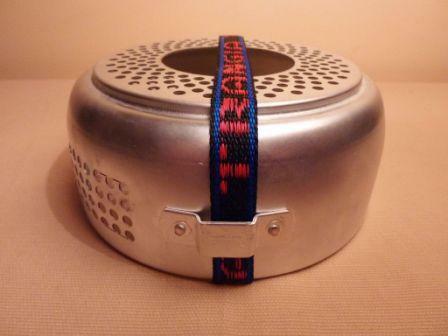 1985 gave birth to the mini Trangia, a popular light weight stove designed for one person. 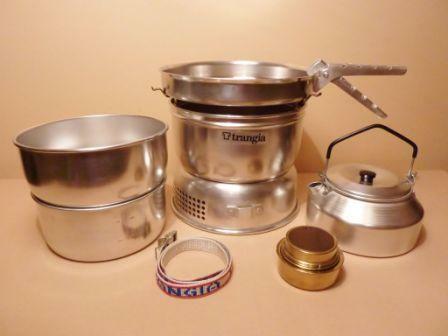 The first photo shows a first generation mini Trangia, differing slightly from later versions, it had a flat frying pan base and smooth finish aluminium burner stand. 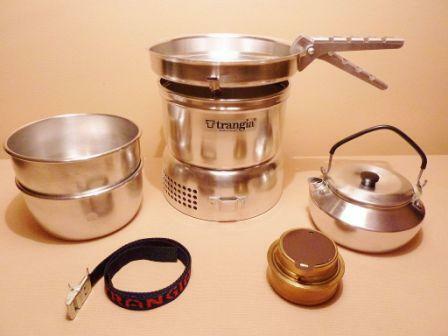 The second photo shows a second generation mini Trangia, notice this time it has a slightly raised frying pan base and the burner stand has a hammered finish the same as current models. 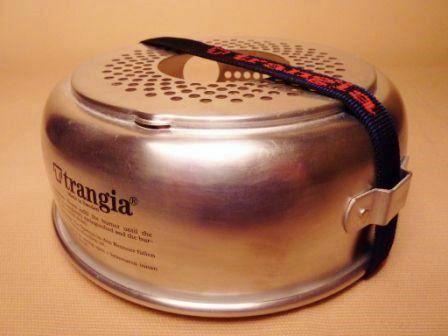 In 1988 the mini Trangia frying pan was given the red non-stick treatment, then later (during the 1990s) had the grey and black speckled finish. Pictured above is an early 1988 model 27-6, without windshield couplings, notice how this stove still has the Trangia badge on the upper windshield and no openings for a gas burner, although 1988 was the year gas burner openings, red non-stick pans and windshield coupling were introduced its evident that red non-stick pans were produced first, that dates this particular stove to early 1988. During the late 80s many noticeable changes happened, the lower windshields were cut out to facilitate gas burners, text also appeared on the lower windshields, windshields were given couplings, and of course, red non-stick pans. First lets look at the changes that took place on the lower windshield. Below are 4 different lower windshields dating from early 1988 to 1990, each one has different characteristics that provide excellent information for establishing the age of your Trangia stoves. 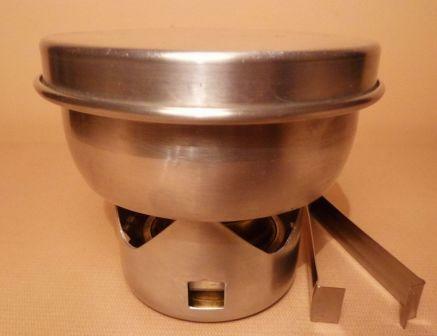 All model 25 stoves have an outward facing rolled edge, its only since 1989-90 that this feature appeared on model 27 stoves, before that, models 27 stoves had a rolled edge on the inside of the lower wind shield. This time the above photo is of a later 1988, 27-6 stove, notice the lower windshield has gas burner openings, and the upper windshield lacks the Trangia badge, so if we compare this stove to the previous 27-6 stove mentioned above, it appears that upper windshield badges were discontinued during 1988, the same applies to the strap, it now has the "T" logo. Late 1989-90, base of lower windshield now manufactured with rolled edge. 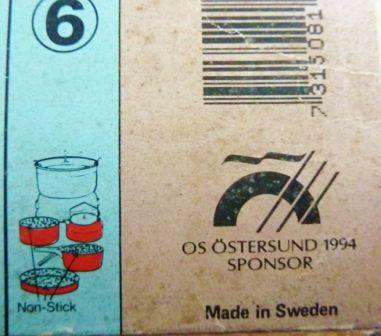 One final note, in 1988 the OS Ostersund 1994, Olympic sponsor was printed on some 1988 Trangia boxes, it also appeared on the upper windshields Trangia badge during this period. 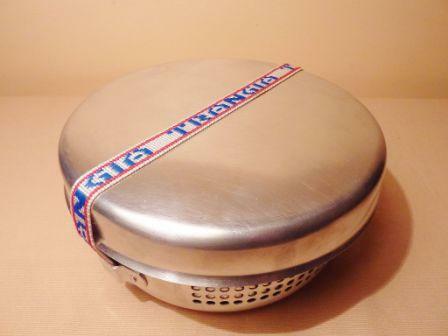 Do you have a 1980s vintage Trangia that you would like to comment about or would you like to send in a photo or two, if so share your story and photos below, its really easy to do.